Here’s the wedding quilt I made for my friends that were married this past summer. I used the Disappearing Nine Patch design (also called the Charm Square Quilt). I started with 12 fat quarters, which I cut up into 5″ charm squares, made the nine patches and cut them in 1/2. The finished block unit is 7″. I added a 1″ sashing, following by the 2″ (or 2.5″?) squares and a 3″ black border. 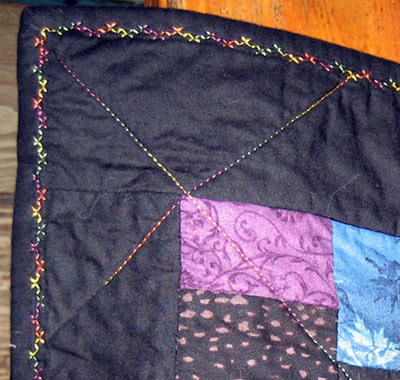 For the quilting, I first anchored each 7″ unit, by stitching in the ditch with black thread. Then I did the large diagonal cross hatch through each unit and into the borders using Superior Rainbows thread in the top and Bottomline in the bobbin. I used one of the fancy stitches to secure the binding and add colourful interest (stitch #16, length 0.25, width 5). I love the way the binding turned out. This is the first quilt I’ve done where I’ve been thrilled with the binding results. You can bet I’ll be using fancy stitches to secure it from now on… hehe. And of course, completed the quilt with the label blanket stitched to the back. While it is a simple design, this is one of my most favourite quilts that I’ve ever made. I’m glad it has a good home. 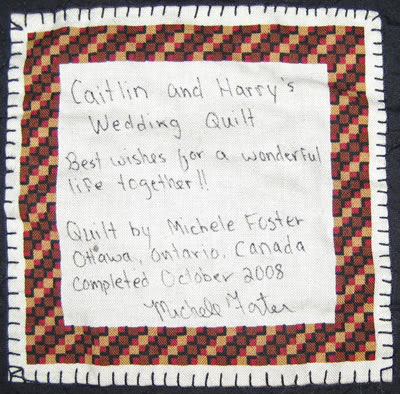 BEAUTIFUL quilt ….. many wishes to the happy couple. Nice quilt Michelle. You have very lucky friends. What a lovely colourful quilt. Isn’t it great to have so many stitches on the modern sewing machines, I use them a lot, especially on small wall hangings. What a truly lovely quilt! 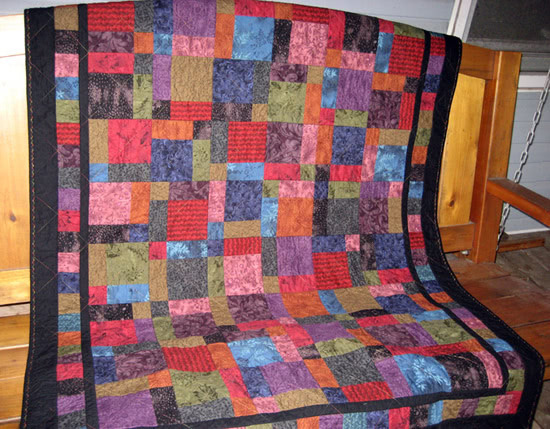 I think it was your use of these beautiful jewel tones that has added a huge aesthetic punch to this quilt. I just love absolutely LOVE it!!! Thank you ladies for your very kind words about my quilt. I must admit, this one was difficult to part with. I’ll just have to make myself one… hehe. I did get a small table runner and a fabric basket for myself out of the same fabric. I’ll post those later this week. Michele, It’s beautiful! The colours really stand out on the black. I was intrigued by the touch of colour on the binding, so I was grateful you took a close up of it. Well done. Congrats to your lucky friends. Love these colors, so rich. I have used the Disappearing 9-patch pattern, it is a lot of fun. The border treatment is unexpected, serendipitous, and creative. Great eye candy. Way to go!! Thanks so much for your post, and what a beautiful quilt!! I love the strong and homely colors you have chosen. the black border really works well with them. .-= Amy’s latest post: The A to Z’s of the Wedding Cake Topper World =-.